On 18 January, admirals from Australia, India, Japan and the US sat together  on stage at the high-profile Raisina Dialogue in New Delhi. Their presence reflected the shared strategic assessment that China has become a disruptive force in the Indo-Pacific. Taking time out to deliver a lecture  at India’s National Defence College, Australian Defence Industry Minister Christopher Pyne echoed remarks by Indian PM Narendra Modi to the Australian Parliament in 2014 , affirming that India had shifted from the periphery to the centre  of Canberra’s strategic frame. 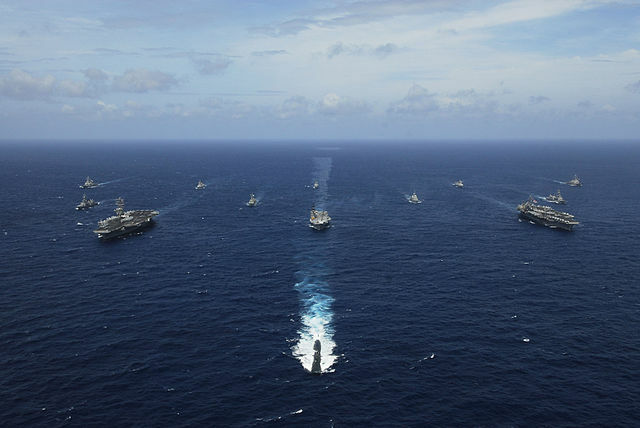 Yet on 30 April, the Australian reported  that Australia had failed in its push to secure an invitation to join Japan and the US in the annual Malabar exercises  with the Indian Navy. The explanation provided was that New Delhi didn’t want to offend China ahead of the informal summit between Modi and Xi Jinping  in Wuhan on 27–28 April. That’s misleading. India’s naval exercises with Japan and the US are a strategic challenge for China; Australia would add only modest capabilities. There’s a threefold basis to India’s reluctance to invite Australia back into the Quad: the shadow of a previous abandonment of the Quad by Australia; an imbalance in the depth of bilateral relations with Australia compared with those with Japan and the US; and consideration of China’s sensitivity. The last is especially important because of perceptions about Australia’s seeming instinct for perpetual war  and the Turnbull government’s turn to an anti-China posture over the past 18 months. The origins of the Quad were entirely benign. In December 2004, in response to the massive earthquake and Indian Ocean tsunami , the four countries with the maritime capabilities, logistical resources, political will and decision-making capacity to act quickly and effectively came together in a core group to coordinate tsunami relief. The memory of that remarkable experience in multilateral cooperation on disaster relief and humanitarian assistance lingered and in time gave birth to the Quad. India’s policy elite remains suspicious of Australia’s reliability. At a joint press conference  in Canberra on 5 February 2008 with his Chinese counterpart Yang Jiechi, Foreign Minister Stephen Smith said: ‘One of the things which caused China concern last year was a meeting of that strategic dialogue [with Japan and the US] plus India, which China expressed some concern with’ and ‘Australia would not be proposing to have a dialogue of that nature’ again. On 10 February, Smith explained  that the 2007 quadrilateral meeting had been a ‘one-off’. While the trilateral dialogue with Japan and the US would continue, the ‘four-way conversation’ would not. The optics of the announcement in the presence of China’s foreign minister, and the substance of the unilateral cancellation of the Quad, still colour India’s assessment of Australia’s credentials. This also explains why India spurned an invitation to Australia in 2017 . India was uncertain of ‘Australia’s “strategic clarity” vis-à-vis China , particularly as China has made significant inroads into Australia’. Yet India was happy to hold bilateral AUSINDEX naval exercises with Australia in 2015 and 2017. The two have also agreed to a 2+2 dialogue involving their defence and foreign secretaries. Ramesh Thakur, a former UN assistant secretary-general, is emeritus professor in the Crawford School of Public Policy at the Australian National University. His most recent book is The United Nations, peace and security (2nd edition, Cambridge University Press, 2017). Image courtesy of the US government via Wikimedia Commons.